It’s really a little crazy here… not even including the actual baseball games we’re serving up info on… the Yankees went on a tear after my last “superstition” post, but my lucky quarter has faded, apparently, and the bronx bombers are back to bombing, and not in the good way. These days, I and several other developer and creative types around here are *frantically* preparing for “on the internet only, no tv” MLB draft next Tuesday and Wednesday. This is always a huge traffic day for us (people hit “reload” a LOT). 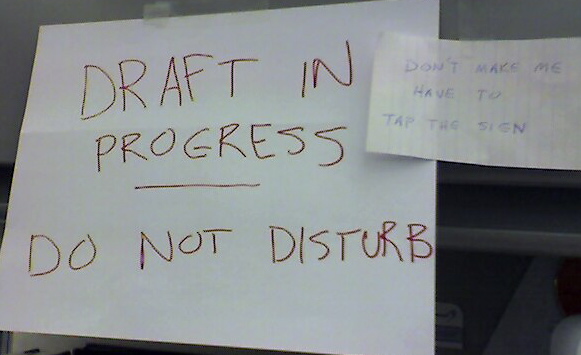 I typically lead a highly interrupt-driven professional life… I and the rest of the group are in the business of fixing things, spur of the moment, but I’ve had to put up signs warning those who would attempt to distract me to put off asking for favors late next week. You blog readers may have to wait, too… although during the draft, hopefully it’ll be smooth, and maybe I can crank out another post or two while I watch the processes run in 8 or 9 x-windows.